Build your own paper XPerimental - Test builders wanted! 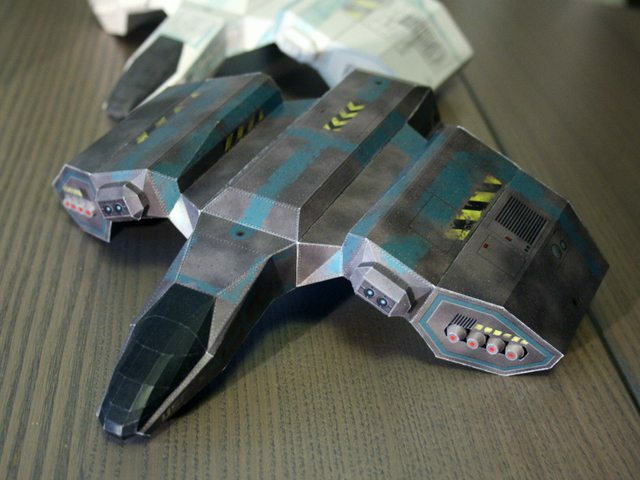 A few years ago I started creating a paper model of the Xperimental shuttle. I based it off of the X3 version but with a greatly simplified geometry. Shortly after, when I was mostly finished with the modeling, somebody released a model of the same ship, apparently taken directly from X:BtF or one of the later games that still contained the original model. This discouraged me a bit, but since the original game textures were fairly low-res, I thought I could do better. I set out to completely re-do all the textures in high resolution, only using Inkscape (a vector-graphics editor). Eventually my interest in the project slowly faded, mainly due to my lack of skills in texturing models like this, and it was left to rot somewhere on my hard disk. When I heard that X:Reunion might be finished in the forseeable future, my interest was sparked anew and I finally finished what I had started. I now have a complete paper model (6 pages, about 200 parts). I want to release a polished version with instructions shortly before the launch of X:Rebirth (in October). Before that, I'd like to get some feedback and make some last tweaks. For this purpose, I'm looking for people to test-build the model! You can download the PDF with some assembly instructions here. The model is intended to be buildable by beginner papercrafters, but there are some more involved parts that might need a few tries to get right by a beginner. Since the instructions are still very limited, you might struggle to get everything right if you have never built a paper model before. Nevertheless, I encourage you to give it a try and give your feedback in this thread. The most important things to remember are to cut exactly and to score all folding lines before folding the paper. Please print the model on thick paper or thin cardboard. For european folks, 160g/m² is ideal. I don't know about paper densities in other countries, but the paper you use should be about double the thickness of your regular office paper to give best results. If you want a glossy look like in the pictures, you might have to use a laser printer or visit a copy shop. If you have more questions, feel free to ask. If not, have fun cutting and glueing and report back if you run into problems. *goes buys a hat*.... *takes my hat to you* well done! OK, I downloaded it and will try to build it next weekend. It is not my first papercraft work, but the previous one was 15 years ago ... will see how it goes. The words in the black arrows on the parts 18, 27, 46, 69, 112, 154, 155, 158, 159, 167, 168, 170 and 171 are very difficult to print, perhaps a black frame for the arrow and a black letters on white background would be better. The assembly hints should be sufficient, only the assembly of parts 20 and 21 is not yet clear to me, I'll just give it a try. I think when you start building, it will be pretty obvious how parts 20 and 21 relate. Just take care to glue part 21 on after you've inserted the internal structure. I guess the resolution should be sufficient for A3 paper. You might want to use heavier paper though (250g?). It's also possible that the overall stability suffers a little from the size. You should be able to circumvent this by not just inserting the internal structures into the parts, but actually gluing them into place (if that isn't what you would have done anyway). The others here told you this would be an awesome work. Now I built it and can say: It is even better than that. I don't remember building a papercraft model with such a good fit. All parts match perfectly and if they don't you did something wrong. An excellent designing work, even by professional standards! The missiles proved to be too tiny for me. I took some sticks of wood, sanded them to size and painted them red so that they look like Hornets in X2. But this was a problem with the size of my fingers, not with the parts. The cockpit canopy. For this I've got no solution yet. Right now it seems to be a provisional arrangement. Black lines on a black surface are not that useful . Additional glueing surfaces could help with building and finding the folding lines. Or perhaps at least extending the folding lines to make them better visible. The parts 106, 107 and 108 (as well as their counterparts on the other side) could also use glueing surfaces. The other parts of the internal frames don't need them because they stabilize each other and you know exactly where to put them. As a summary, it was really a pleasure to build the model. Some minor challenges like the rear end of the fuselage or the gun ports just add to the joy. Even more as they improve the level of detail. Again, great work! Thanks a lot! Your comments are well appreciated and I will take them into account. The missiles are indeed tricky. I found it easiest to round the paper by rolling it between my finger and a toothpick. You then need to make a separate glue part to close the tube from the inside. Something similar is needed for the cockpit window. I will add explanations about this technique to the final instructions. Would you share some pictures of the finished model? I'm very interested in the results, especially if you printed the parts on A3 paper. For pictures I need to redo a part of the wing and the cockpit canopy of course so it will take perhaps until next weekend. I used A4 which proved to be the right decision since I had to print some parts again. Basically it was just a test build so neither printing nor building quality are as high as possible.